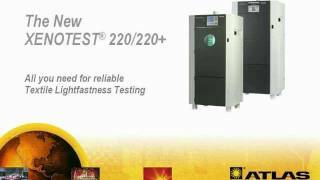 The Xenotest 220 and Xenotest 220+ are large capacity lightfastness testers dedicated for textile testing. They come with premium on-rack light and temperature sensor and non-aging optical filter technology. With the ability to test 38 samples, the 220 Series provides nearly twice as much capacity in the same footprint compared to 150S+. The combination of its large test chamber and the efficient use of power and water make it today‘s most economic air-cooled instrument available. It complies to standards ISO 105 B02, AATCC TM16 (option 3), and Marks & Spencer C9, C9A.